The most comprehensive, up-to-date and free list of the world's major bank M&A activities. Welcome to Swire Chin’s List of International Banking Mergers and Acquisitions. This web site aims to chronicle the corporate genealogy and M&A history in the banking industry. Over 80 of the world's largest and most well-known banks have been documented. Click on Index to access all earlier publications. Existing publications are updated whenever a major banking acquisition or divestment is announced. Like many people nowadays, I’ve a love-hate relationship with banks. I do, however, enjoy reading and recording the history of commercial banks. Please feel free to email me if you’ve any comment. My email address can be found on the "About Me" section of the web site. 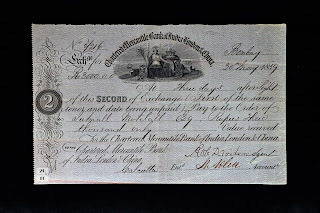 Photo: A bill of exchange, a sort of promissory note for making payment, dating from 1859. 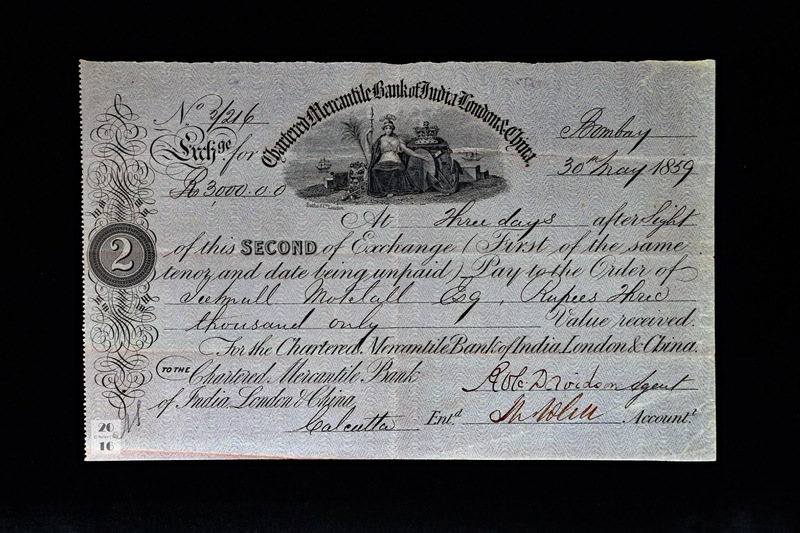 This is one of the earliest surviving documents from the Chartered Mercantile Bank of India, London and China, which was known as the Mercantile Bank of Bombay between 1853 and 1857; the Chartered Mercantile Bank of India, London and China between 1857 and 1892; the Mercantile Bank of India between 1893 and 1957, and the Mercantile Bank Ltd. between 1958 and 1984. The Mercantile Bank Ltd. had a very storied past full of ups and downs. It was once upon a time a local Indian bank, then it became a British bank, and eventually a Hong Kong bank in its final decades. The bank was founded in 1853 as the Mercantile Bank of Bombay as a trade finance bank. By 1857, the bank had opened offices in London, Madras (now Chennai), Colombo, Kandy, Calcutta (now Kolkata), Singapore, Hong Kong, Canton (now Guangzhou), and Shanghai. In that same year of Mercantile Bank of Bombay’s founding, however, the establishment of a rival British overseas bank also with a focus on British India, China and the colonies in the Orient applied for and obtained a Royal Charter from Queen Victoria, and called itself the Chartered Bank of India, Australia and China (today’s Standard Chartered plc). A Royal Charter used to be the only means to establish a public or private corporation, but by the mid-19th century it certainly was not the sole process to do so. While a Royal Charter defines a corporation’s privileges and purposes such as those of a town or a city, the granting of such by the Victorian era no longer indicated, for example, Royal patronage, nor implied or express state guarantee in times of troubles. Even though a Royal Charter is technically granted only to a body or business which can demonstrate pre-eminence and stability, constitutionally or legally, there is no reason to believe that a “chartered” business is any more or less likely to be successful than those without a charter. Nevertheless, the Mercantile Bank of Bombay felt that it was at a competitive disadvantage and did not want to be outdone by the regal sounding Chartered Bank of India, Australia and China, which had a habit of promoting itself as being “Incorporated in England by Royal Charter 1853.” Therefore, in 1857, the Mercantile Bank of Bombay also obtained a Royal Charter and renamed itself the Chartered Mercantile Bank of India, London and China, and moved its head office from Bombay to London. In doing so, the Chartered Mercantile Bank of India, London and China was often mixed up with the Chartered Bank of India, Australia and China – the fact that both banks were founded in 1853 doubtlessly added to the confusion. Following the tradition in Great Britain at the time, banknotes in the British colonies were often issued by certain authorised commercial banks. After receiving the Royal Charter, the Chartered Mercantile Bank of India, London and China gained the privilege to issue banknotes in Hong Kong (starting in 1859), in Penang (starting in the 1860s) and later also in Malacca and Singapore. As a matter of fact, the bank played a prominent role in the early banking development in the Straits Settlements and the Federated Malay States, which became today’s Malaysia and Singapore. In 1892, however, the Chartered Mercantile Bank suffered a liquidity crisis and had its Royal Charter revoked. It was re-capitalised as the Mercantile Bank of India in 1893, but it ceased to issue all banknotes. In the early 20th century, growth returned to the Mercantile Bank of India and it, for example, acquired the locally-incorporated Bank of Calcutta (founded 1895). In 1912, the Mercantile Bank regained the privilege to issue banknotes in Hong Kong. It also issued banknotes in the Chinese port city of Shanghai for years during the early 20th century. (Between 1846 and 1945, Great Britain controlled “concessions” -- extraterritorial jurisdictions -- in China, and the Shanghai International Settlement was probably the most well-known one of all.) Surviving 19th century banknotes issued by the Chartered Mercantile Bank of India, London and China from Hong Kong, Singapore, Malacca, and Penang; and even mid-20th century examples by the Mercantile Bank of India from Hong Kong and Shanghai are very rare, and can command very significant valuations at auctions. In 1916, the Mercantile Bank of India took over the Bank of Mauritius. This was the third bank of the same name – none of them were related to one another -- to have existed in Mauritius. This particular Bank of Mauritius was established in 1894 to take over the local operations of the Oriental Bank Corporation that had gone bankrupt. The Oriental Bank Corporation was another prominent Anglo-Indian bank that was active in British India, Ceylon, Singapore, Hong Kong and China in the mid-19th century before its demise. While rival British overseas banks like the Chartered Bank of India, Australia and China and The Hongkong and Shanghai Banking Corporation (HSBC) have had a strong focus in Hong Kong, China and the rest of the Far East, the Mercantile Bank’s main focus was in British India, where the bank had half of its branches. In 1947, British India gained independence and became India and Pakistan. The newly formed nation-states wanted to nurture their own domestic industries and became increasingly restrictive to the British businesses including the Mercantile Bank of India. New regulations in place banned foreign banks from opening new branches, and growth in the 1950s for the Mercantile Bank in India was much hampered. Towards the late 1950s, it was believed that the Mercantile Bank of India would be vulnerable to a takeover by an American bank eager to have a presence (however restrictive) in the Indian market. Ironically, right around the same time, the decision was made to drop the reference of India from the name and the bank became the Mercantile Bank Ltd. In 1957, The Hongkong and Shanghai Banking Corporation pre-empted the rumoured American interest by first acquiring a 20% stake in Mercantile Bank Ltd., before fully acquiring the remaining shares in 1959. HSBC kept the Mercantile Bank operations separate and independent for many years. In 1966, Mercantile Bank relocated its head office from London to Hong Kong. Interestingly, Mercantile Bank continued to be a banknote issuer in Hong Kong until 1974 (along with HSBC and the Standard Chartered Bank). In 1984, finally Mercantile Bank’s operations were integrated into HSBC, except for the small Thai operations, which were sold to Citibank. The sale of this small unit of the Mercantile Bank appeared to have caused much confusion about the final years of the bank, as many sources, including Wikipedia, often suggest mistakenly that HSBC sold the entire Mercantile Bank to Citibank in 1984. 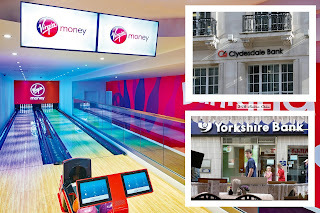 Photo: The Virgin Money lounge in Sheffield, Yorkshire, has a complimentary bowling alley for clients to enjoy. The insets show a Clydesdale Bank branch at London's Piccadilly Circus, and a Yorkshire Bank branch in Whitby, North Yorkshire. Photo Sources: Virgin Money lounge in Sheffield, Virgin Money; Clydesdale Bank in London, Swire Chin; Yorkshire Bank in Whitby: Swire Chin. 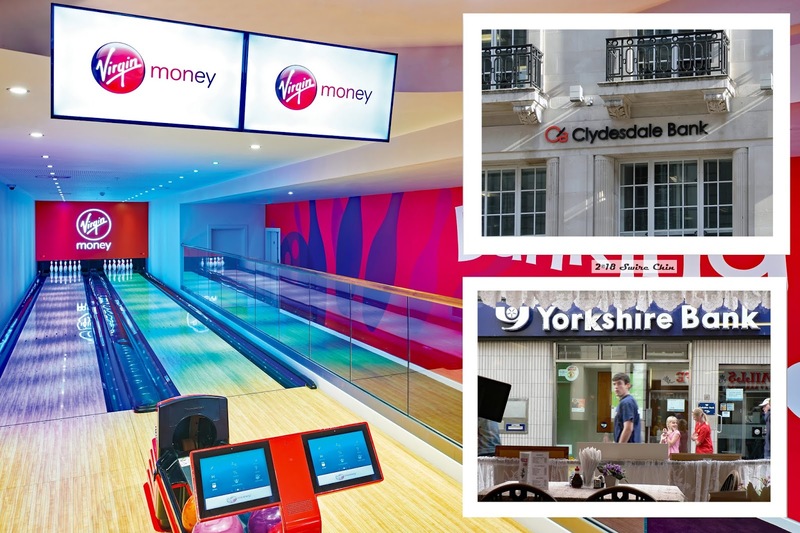 The Clydesdale Bank, Yorkshire Bank and Virgin Money each has a complex history and relationship with each other since their separate beginnings. They were established independently of each other but interestingly, all three banks have been under partial or full Australian ownership at one some point. Glasgow-based CYBG plc is the parent company of Clydesdale Bank and Yorkshire Bank, which in May 2018 agreed to acquire challenger bank Virgin Money for GBP 1.7-billion. The Clydesdale Banking Company was founded by Glasgow’s businessmen in May 1838 in the joint-stock format to serve the local market. The Clyde is a major river that flows through Glasgow, and the vale area surrounding the river is called Clydesdale. Right from its start, offices were opened in the industrial city of Glasgow as well as in the capital city of Edinburgh about 40 miles to the east. Within its first year of operations, Clydesdale also opened two country (rural) branches in Falkirk and Campbeltown. The 19th century was the hundred years that witnessed the most rapid, disruptive and yet transformative technological, social and economic changes in British history. Newly-invented machinery greatly expanded the output of consumer and industrial goods, as well as of agricultural produce. Meanwhile, the ever-expanding railway network not only made transportation of raw materials, finished goods, people and communications (such as news, letters and parcels) much faster and cheaper, it also allowed perishable produce to reach destinations much farther than previously possible before spoiling. This mechanization and transportation revolution, which was part of the overall industrial revolution, favoured larger-scale farms and manufacturing factories over the one-person artisan shops and small-scale farms that previously dominated the economy. This shift towards larger scale operations required much larger capital investments and financings, and the formerly local banks and small private banks were ill-capitalized to support and take on the risk of these burgeoning capital-intensive industries. During the mid-19th century, many of these small provincial or private banks amalgamated with each other, and converted into joint-stock banks that could raise capital by issuing new shares to shareholders. In 1840, Clydesdale Bank took over the Greenock Union Bank. Despite that, by 1857, it still only had 13 branches and remained a smallish bank. It was perhaps this prudence that kept the bank in relative financial health, for in that same year, the 101-branch Western Bank of Scotland, the second largest bank in Scotland at the time after the Royal Bank of Scotland (RBS), collapsed during a general financial panic, and Western Bank’s operations were broken up and taken over by other rivals, including the RBS, Clydesdale and others. During the same crisis, the City of Glasgow Bank also suspended payments (operations), and likewise some operations were transferred to Clydesdale Bank, which doubled its number of its branches. Shortly after World War I, the smaller and weaker Scottish banks found themselves facing challenging market conditions, and a wave of Anglo-Scottish takeovers happened. In 1919, London City and Midland Bank (later becoming Midland Bank and today’s HSBC), at the time the world’s largest bank based on deposits, took over Clydesdale Bank. Then in 1923, Midland further acquired the North of Scotland Bank. As in all Anglo-Scottish or Anglo-Irish bank takeovers, the management, corporate identities, boards of directors and operations of the acquired banks remain separate from the parent bank. Hence, both Clydesdale and the North of Scotland enjoyed to a large degree their autonomies. This only changed in 1950 when Midland’s two Scottish units were combined to become the Clydesdale and North of Scotland Bank. Eventually, the rather cumbersome name was shortened back to Clydesdale Bank. In early-1980s, Midland Bank itself became mired in the Latin American debt crisis, and had to divest its loss-making businesses and raise new funds to shore up its depleted capital. In 1987, Midland Bank sold Clydesdale Bank in Scotland (for GBP 420-million) and Northern Bank in Northern Ireland and Ireland (for a symbolic AUD $2) to the National Australia Bank (NAB) group. NAB was at the time keen to expand outside of its Australian and New Zealand home markets. In 1990, NAB further acquired Yorkshire Bank for GBP 976-million (see separate section below). These three purchases gave NAB a meaningful but if only regional footprint in Northern England, Scotland, Ireland and Northern Ireland, but not in the economic powerhouse in Greater London and Southern England. During the early 2010s, however, Clydesdale Bank and Yorkshire Bank were caught up in an industry-wide (in Great Britain) unethical and fraudulent mis-selling and mis-handling of a financial product known as payment protection insurance (PPI), negatively impacting hundreds of thousands of affected clients. Worse still, this PPI scandal broke out in the midst of the decade-long worldwide credit crisis that began in 2007, which resulted in soaring loan and trading losses, ultra-low interest rate spreads (which adversely impacted bank profitability), reduced demands for loans, little appetite for merger and other investment banking activities, and the need to unwind risky and complex financial positions – a process often called de-leveraging. By 2014, NAB concluded its British operations were too small to compete efficiently with the bigger players in the market, and that it would be unaffordably costly to try to win market share. A decision was made to exit the United Kingdom retail banking market. However, by this time the PPI scandal had blown up into a very expensive mistake for both Clydesdale and Yorkshire Banks. The two banks eventually had to set aside at least GBP 2.1-billion of potential compensation to the PPI claimants. In order to make Clydesdale and Yorkshire Banks a financially viable autonomous business, NAB agreed to cover GBP 1.58-billion of the PPI scandal provisions to relieve their financial pressure. Finally, in early 2016, NAB spun off and floated Clydesdale Bank and Yorkshire Bank under a holding company called CYBG plc. NAB transferred 75% of CYBG shares to NAB shareholders, and sold the remaining 25% stake to institutional shareholders. To allow the Australian shareholders easy access to trade CYBG shares, CYBG was listed on both the London Stock Exchange and the Australian Securities Exchange. In 1859, Yorkshireman Colonel Edward Akroyd, a wealthy owner of large textile mills in Halifax, founded the West Riding of Yorkshire Provident Society and Penny Savings Bank. His wish was to encourage his workers to handle income prudently and to save for a rainy day. Col. Akroyd was one of those Victorian benevolent industrialists who strongly believed in caring for and improving the livelihoods of his employees and their families. As a matter of fact, he even had housing complexes and a school built right next to some of the factories where his workers worked. As a provident society, the bank was originally a co-operative (a mutual bank). The new bank took off to a great start and began setting up offices in nearby towns. Being Britain’s largest county, Yorkshire’s administration was divided into three “ridings”: East, West and South. Col. Akroyd initially only had planned to operate in the West Riding. But in 1861, the bank abandoned both the “provident society” format and the West Riding focus, becoming the Yorkshire Penny Bank with well over 100 offices across the entire county. Banking back then, particularly for a penny bank catering to the working lower class, was very different from today. The offices often amounted to no more than a counter located in a village school room, or a church basement, and typically only opened for business one evening a week. Yorkshire Penny Bank was said to be the first bank in the world to introduce the “school bank” concept in 1865, maintaining accounts for school children (as opposed to having an office inside a school for working adult clients). The bank’s first full-time daily branch opened in 1871. In any case, the Yorkshire Penny Bank became a local institution for the county. Col. Edward Akroyd was so much loved and respected that some 15,000 mourners showed up at his funeral in 1887. His former residence in Halifax is now the Bankfield Museum. In the 1911, however, an audit determined that the Yorkshire Penny Bank’s reserves were significantly underfunded and the Bank of England brokered a joint rescue-takeover of the bank by a long list of English clearing banks: National Provincial Bank, Westminster Bank, William Decons Bank, Lloyds Bank, Barclays Bank and Glyn Mills. At its centenary in 1959, the bank adopted a simplified name of Yorkshire Bank. In 1990, the National Australia Bank (NAB) group was keen to expand in the British Isles after its 1987 takeover of the Clydesdale Bank (in Scotland) and Northern Bank (in Northern Ireland and Ireland) from Midland Bank. Meanwhile, the English banks controlling Yorkshire Bank were also eager to divest their minority stakes, and Yorkshire Bank was sold to NAB for GBP 976-million (USD $1.65-billion). At that time, National Westminster (NatWest) held 40% of Yorkshire, Barclays (32%), Lloyds (20%) and the Royal Bank of Scotland (the remaining 8%). Long dominated by historical banks established in the 1600s, 1700s and 1800s, the British banking industry witnessed monumental changes after the 2007 global credit crisis and the technological disruption introduced by the internet and mobile phone in the 2010s. One result of these changes was the rapid emergence of new, mostly “branchless” banks, such as Virgin Money. This happened because: 1) the business of banking has moved rapidly towards internet and mobile-phone banking away from in-person branch banking; 2) the traditional “High Street” banks were busily cutting back branches and staff to reduce costs following heavy losses from the credit crisis; and 3) new banks with minimal numbers of branches have lower overhead costs and can offer better rates and prices for their clients. In the United Kingdom, these new banks are called “challenger banks” as they aimed to challenge the long-established “High Street” banks. Virgin Money itself has a very short history, having been established only in 1995 initially as “Virgin Direct Personal Financial Service Ltd.” by Sir Richard Branson’s Virgin Group. Initially Virgin Direct was an income personal equity plan (known as “income PEP”) platform as a 50-50 partnership with insurer and asset manager Norwich Union. The income PEP was a registered account that allowed people over the age of 18 to invest a maximum annual amount in shares of British companies tax-free, meaning that the income and capital gains generated within the income PEP were not taxable. In 1999, the British government replaced the income PEP with the “Individual Savings Account” (ISA), which means that people are now able to put their money into a savings account and term deposit to earn interest tax-free, instead of being required to invest only in stocks that are more risky. By having a lower maintenance fees than other financial institutions, Virgin Direct claimed that it received 4,000 phone calls on its opening day, and attracted GBP 42-million of assets under management in the first month. In 1996, Virgin launched the Virgin Personal Pension product, again using the easy-to-understand and low-fee strategy to lure new clients from the traditional financial-services firms. By 1997, Virgin Direct had already attracted GBP 1-billion in funds under management, at which time it launched the One account in partnership with the Royal Bank of Scotland (RBS) and Australian financial service group AMP (originally Australian Mutual Provident) to offer the “offset mortgage” product. At its launch, RBS owned 50% of the One account platform, with Virgin Direct and AMP each owning a 25% stake. A traditional mortgage loan typically has a set interest rate, a fixed repayment schedule, and strict limitations on how much, if any, of the outstanding mortgage loan can be repaid ahead of (or behind) schedule. An offset mortgage like the Virgin One, on the other hand, charges interest on the outstanding mortgage balance less the balances in the borrower’s savings accounts on a daily basis. In other words, every time money is deposited into the borrower’s savings account (such as a payroll deposit), the balance of the mortgage loan drops (hence “is offset”) by that deposit. This flexible mortgage payment option has the potential to speed up significantly the full repayment of the loan than a traditional mortgage. Initially available only to Virgin Direct’s 200,000-strong income PEP and Personal Pension clients, the One account was so popular that it was expanded to the general public by 1998. Also in 1997, Australia’s AMP acquired Norwich Union’s 50% stake in Virgin Direct. As part of the agreement, AMP gained the worldwide licence to use the “Virgin” brand in retail financial services. In 2000, Virgin Group once again partnered with AMP to launch “virginmoney.com” as a one-stop on-line “supermarket” for financial products such as ISAs, unit trusts (mutual funds), mortgages and life insurance. In 2001, the Royal Bank of Scotland took over the Virgin One mortgage platform from Virgin Direct (25%) and AMP (25%) for about GBP 100-million. Virgin One had about 70,000 accounts and GBP 3.75-billion of mortgage receivables at that time. In 2002, Virgin Direct and VirginMoney.com were amalgamated to become Virgin Money, and continued to be jointly-owned by Virgin Group and AMP. Meanwhile, Virgin Money launched its first credit card offering. Despite the agreement with AMP to license the “Virgin Direct” brand worldwide in 1997, it was only in 2003 that Virgin Money Australia was launched to offer credit card products outside of Britain for the first time. Virgin Money Australia eventually expanded into the superannuation, mortgage and insurance business. Further expansion saw Virgin Money opening for business in South Africa in 2006 and the United States in 2007. However, the American banking market is incredibly competitive and difficult to penetrate. Merely three years late, Virgin Money US was shuttered. And the South African operations also remained minuscule. In 2004, AMP spun off and floated its British operations into HHG plc, which included the 50% stake in Virgin Money, which HHG immediately sold to Virgin Group for GBP 90-million (AUD $220-million), hence allowing Virgin Group to fully control Virgin Money for the first time. Even though by now Virgin Money had over 700,000 clients across Britain and GBP 4.7-billion of client assets, profits remained very slim. In 2010, American billionaire financier Wilbur Ross acquired a 21% stake in Virgin Money for GBP 100-million. The following year, Virgin Money and Virgin Group, backed by Wilbur Ross and Abu Dhabi investor Stanhope Investments, took over the nationalized regional bank Northern Rock from the British Treasury for GBP 747-million in cash plus GBP 150-million of debt funding. The British government had sunk GBP 1.4-billion back in 2007 to rescue and nationalize the bankrupt Northern Rock, which had 75 branches at the time of the Virgin acquisition. Following the combination, Virgin Group’s stake in Virgin Money was diluted to 46%, with Wilbur Ross’s various investment vehicles holding 44% and Stanhope Investments the remaining 10%. The year 2011 also saw the opening of the first Virgin Money lounges in Edinburgh and Norwich. Virgin Money lounges are meant to give clients a place to relax and unwind. The lounges offer complimentary refreshments, wi-fi internet service, newspapers, magazines and iPads. Each lounge has a unique design, such as the imitation of the interior of a Virgin Atlantic Airways airliner, or a bowling alley, or a cinema. Virgin Money lounges are offered free of charge for community events after hours. As of 2018, there are eight Virgin Money lounges. Like its British parent, Virgin Money Australia was never particularly successful nor profitable. In 2013, conceding that its Australian business failed to gain market share and deliver anticipated profitability, Virgin Money sold Virgin Money Australia to local regional lender Bank of Queensland for AUD $40-million. In 2014, Virgin Money was floated on London stock exchange when owners Sir Richard Branson’s Virgin Group and Wilbur Ross each unloaded about 15% of the bank. Following the IPO, both investors retained about one-third of the British bank. In May 2018, CYBG agreed to take over Virgin Money for GBP 1.7-billion (USD $2.3-billion) in cash. The combined operations would become the No. 6 bank in the United Kingdom with 6 million clients. Despite that, the new bank would still only control about 2% of the market share, compared with market leader Lloyds' 24% share. Virgin Money’s 74 branches will be combined into CYBG’s 169-branch network, but branch closures and 1,500 job losses are planned. Existing CYBG shareholders would own 62% of the new bank, with existing Virgin Money holders owning the rest. Virgin Group’s stake in Virgin Money will fall from 34.8% to 13.1%. In a rather controversial and puzzling arrangement, the new bank plans to adopt the brand “Virgin Money” for all of its “High Street” (i.e. retail banking) operations and will pay an annual GBP 12-million licence fee to Virgin Group for the first three years, rising to GBP 15-million in the fourth year, then a 1% annual royalty based on revenue to Sir Richard Branson. Some existing clients and employees of both Clydesdale and Yorkshires are also said to be dismayed about the branding changes. I've a great interest in commercial banking history and the history of finance.